From a client brief that originally called for 12 homogenous residential towers, Zaha Hadid Architects (ZHA) has proposed an alternative community-orientated design comprised of a low-rise, yet high-density residential building of 981 apartments with accommodation around three sides of the rectangular site. 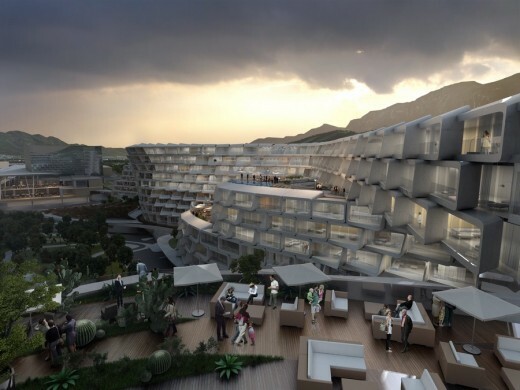 Each side of the Esfera City Center building has been shaped to optimize its environmental orientation, creating a sequence of interconnected internal and external courtyards, gardens and public spaces for both residents and neighbours. 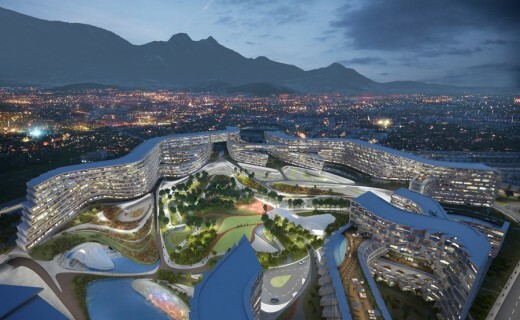 Monterrey is the third largest city in Mexico and one of its most important business and manufacturing centres including companies such as CEMEX, Groupo Alfa, DINA, Lanix, Coca Cola Femsa, Cuauhtémoc Moctezuma Heineken’s and Vitro Glass. 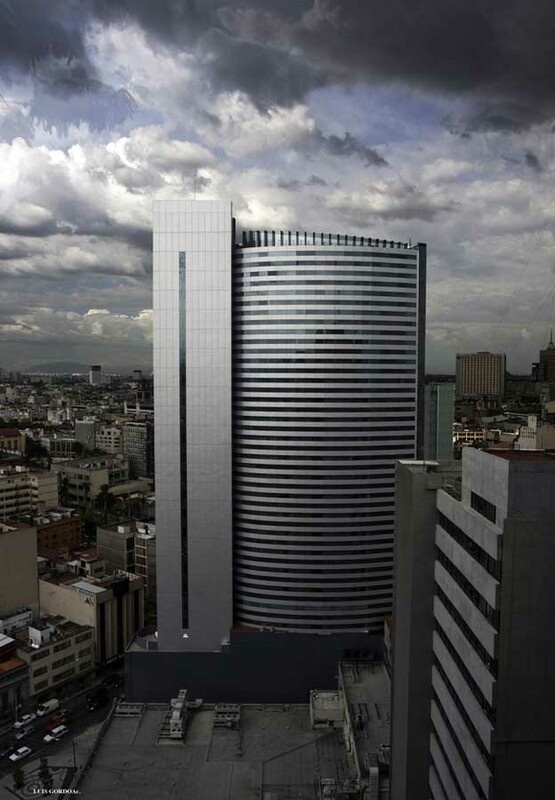 Monterrey has also developed as an international IT centre with companies including Accenture, SAS Institute, and GE also located in the city. Composed of 9 municipalities, Monterrey has grown rapidly since 2000 as an important centre of manufacturing and technology, supported by the Monterrey Institute of Technology and many key faculties of the UANL university to the southeast of the city. Also located in the Huajuco Canyon to the southeast of the city, the Esfera City Centre residential project provides essential new homes for Monterrey’s fast-growing population. 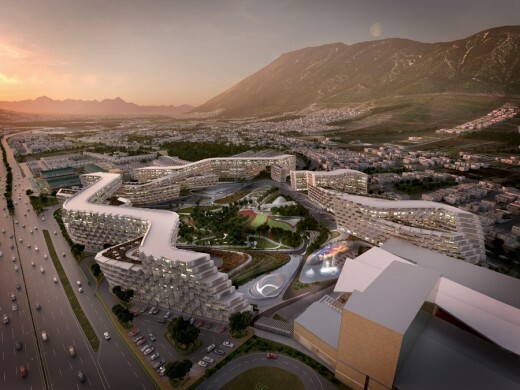 As part of the city’s on-going plans for growth without increasing congestion and demands on the existing social and infrastructure networks in the city centre, the canyon is growing into an important new employment, residential, transport, educational and entertainment hub in the southeast of Monterrey. The Huajuco Canyon is a long and narrow valley flanked by two mountain ranges, creating a subtropical microclimate that is less harsh than conditions in the city centre, with fresher summers and winters allowing residents to take full advantage of their outdoor spaces. 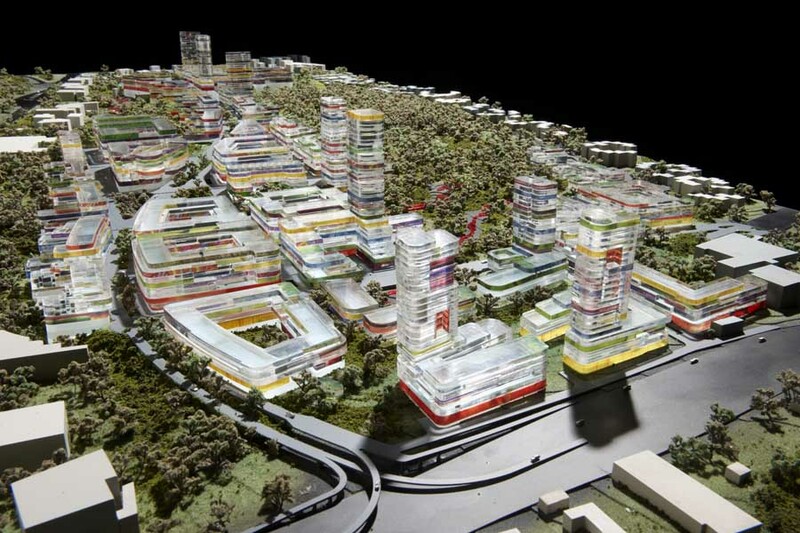 Straddled between the very diverse urban conditions of the eight-lane Federal Highway and low-density suburban housing developments, the proposal responds to the varied urban conditions of its context; integrating this low-rise, high density residential community within the new commercial centre of the canyon. A community-oriented approach has been central to the design. 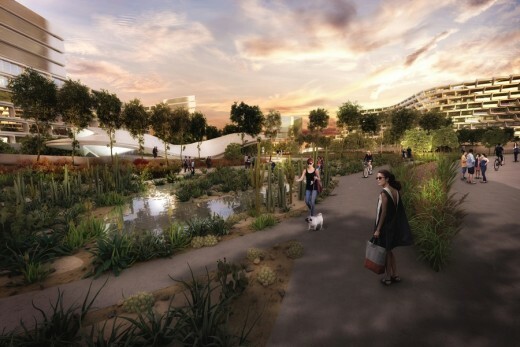 By incorporating principles of CPTED (Crime Prevention Through Environmental Design) which include welcoming, interconnected public spaces popular with neighbours and passers-by, the design offers increased levels of community safety whilst also contributing to the urban integration and composition of the project. With the inclusion of these public spaces at the perimeter of the building, the project engages with its context within the growing commercial centre. The building’s envelope references the local architectural language and Mexican tradition of interlocking lattice geometries to provide shading and describe the outdoor space of each residence. These lattice geometries have been used widely throughout pre-Columbian, colonial and contemporary Mexican architecture to give protection from the sun and generate varied and dynamic displays of light and shadow. 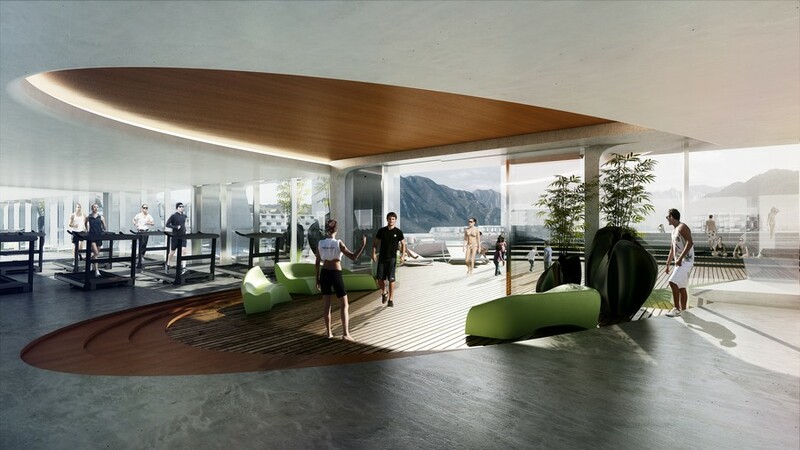 By considering their solar orientation, internal programme, spatial requirements and adjacencies, each balcony’s form has been developed to provide solar protection, privacy and generous exterior space for the apartments; defining a varied and coherent architectural language that unites the project. The design targets high standards in sustainability. The building’s mass allocation and layout responds to the ideal solar orientation for the apartments and aims to channel the site’s wind patterns, allowing residents to enjoy the outdoor spaces and natural ventilation offered by the fresher micro-climate of the Huajuco Canyon. With façade orientation, ground level shading and optimization of natural ventilation, the ambient temperature is reduced to give better human comfort values. 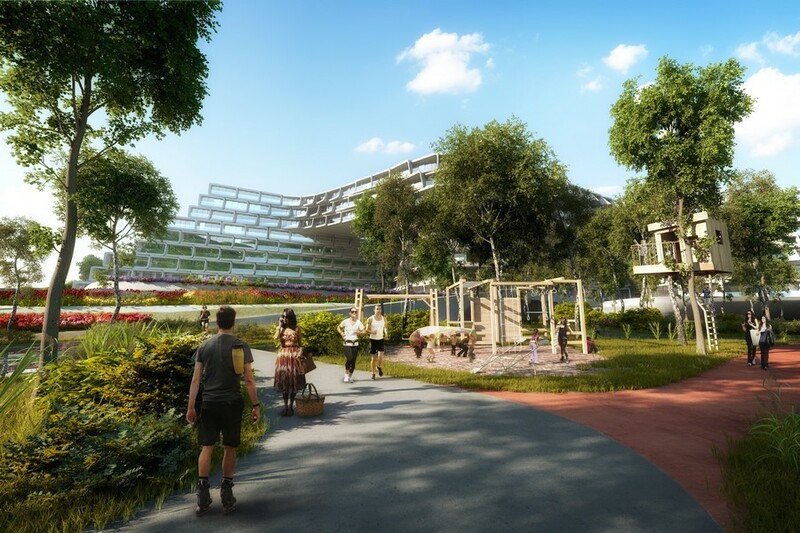 The materials of all external areas has been selected with consideration of their permeability, high reflectivity and low thermal mass to reduce the mean radiant temperature, together with their ability to drain rain water into the soil. 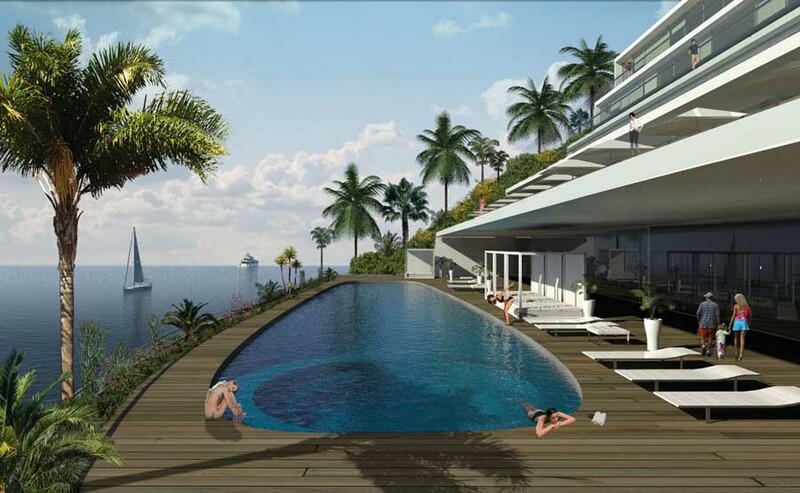 The form of each balcony has been determined by factors that include the ability to control that solar radiation particular to that part of the building, acting as a brise soleil that varies – extending laterally or horizontally as necessary – according to the orientation of each apartment. 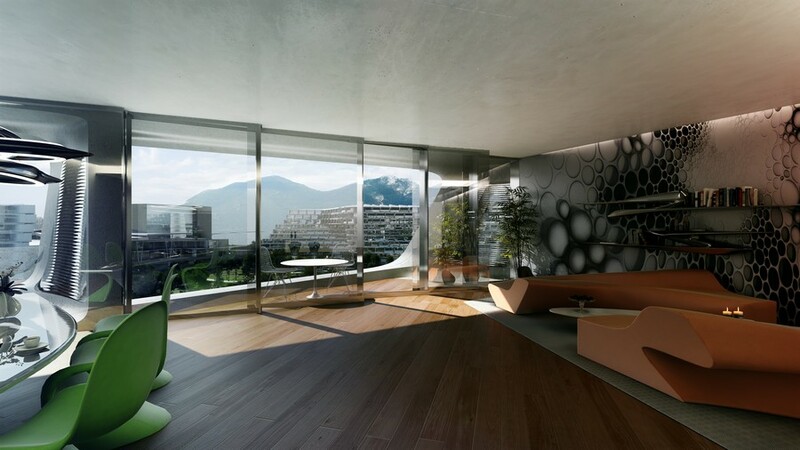 Project Director (ZHA): Juan Ignacio Aranguren C.
Project Team (ZHA): Sofia Amodio, Pierandrea Angius, Megan Burke, Cristina Capanna, Gerry Cruz, Johannes Elias, Veronica Erspamer, Gianni Giuffrida, Marco Guardincerri, Soomeen Hahm, Lisa Hofbauer, Julia Hyoun Hee Na, Stefano Iacopini, Lisa Kinnerud, Alexandre Kuroda, Mariagrazia Lanza, Carolina López-Blanco, Milica Pihler-Mirjanic, Sobitha Ravichandran, Kate Revyakina, Yitzhak Samun, Ricardo Sosa-Mejia, Ana Wang Zuñiga, Fei Wang, Fulvio Wirz, Paolo Zilli. amenities for residents are located.